The idea is simple. 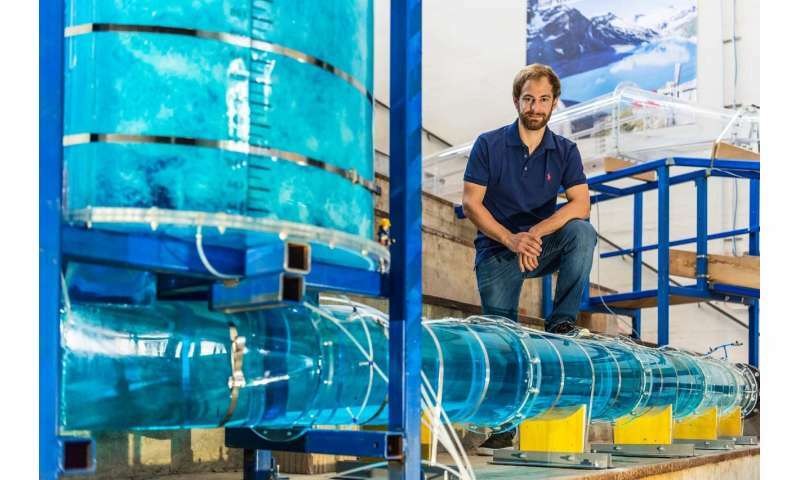 A team headed by Franz Georg Pikl, a Ph.D. student at the Institute of Hydraulic Engineering and Water Resources Management at TU Graz, has combined the advantages of pumped storage technology and heat storage using water as a medium to create a "hot-water pumped storage hydropower plant." The new system stores and supplies electricity, heat and cooling energy as required. The first element is pumped storage hydropower, a technology that has been steadily refined over the past 100-plus years. It is currently the most reliable, efficient and durable form of electricity storage. Pumped storage hydropower schemes are mainly found in mountainous countries, as they require a difference in elevation between two reservoirs, as well as sufficient amounts of water. When large volumes of power are generated, the excess electricity is used to pump the water from the lower reservoir to the higher one. If electricity demand increases, the water flows back down and drives turbines that in turn generate power. Pikl has implemented this principle completely underground. Subterranean tunnels are used to create the difference in elevation between the two underground reservoirs needed to produce electricity, regardless of the topography. This minimises the area required, and simplifies both the process of finding a location as well as the mandatory approval procedure. Heat accumulators, where the thermal energy is stored, form the second component of the new storage concept. Thanks to its high specific heat capacity, water serves as an additional thermal energy storage medium for the underground pumped storage power plant. Renewable energy is used to heat the water to up to 90°C. 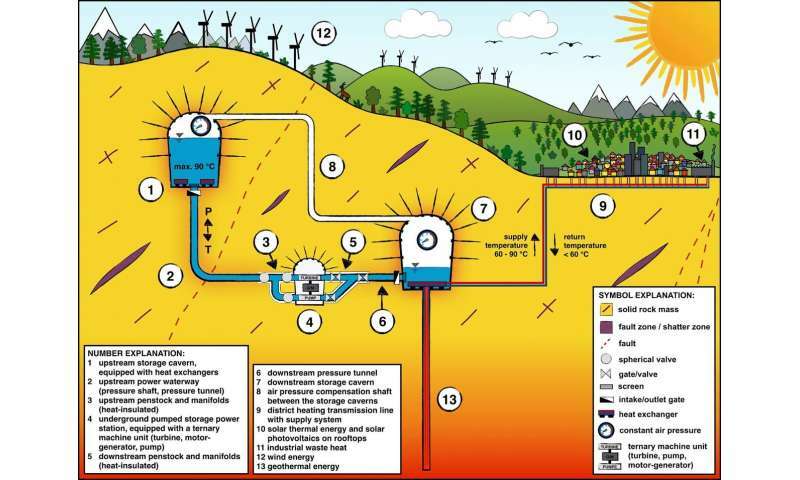 Thermal energy is stored and used by means of heat exchangers installed in the underground reservoirs. When demand for heat is high, it can be supplied directly to consumers via district heating transmission lines. Franz Georg Pikl also integrated district cooling technology into the concept – this method of cooling buildings is becoming increasingly significant – in the shape of absorption chillers. When required – in other words, on warm days – the hot water drives the chillers, which produce cooling energy that is distributed to customers along district cooling transmission lines. To ensure a constant supply of cooling energy to various temperature zones, this system can be modified by cooling the water of the underground pumped storage hydropower scheme – which could then be labelled a "cold-water pumped storage hydropower plant." Technological and energy-related feasibility studies underline the high degree of efficiency and cost-effectiveness of this hybrid storage concept. "The combination of such highly efficient systems, with efficiency factors of around 80% for electricity and heat storage, results in a significant increase in total energy storage compared to separate implementation, and the level of resource consumption remains the same. 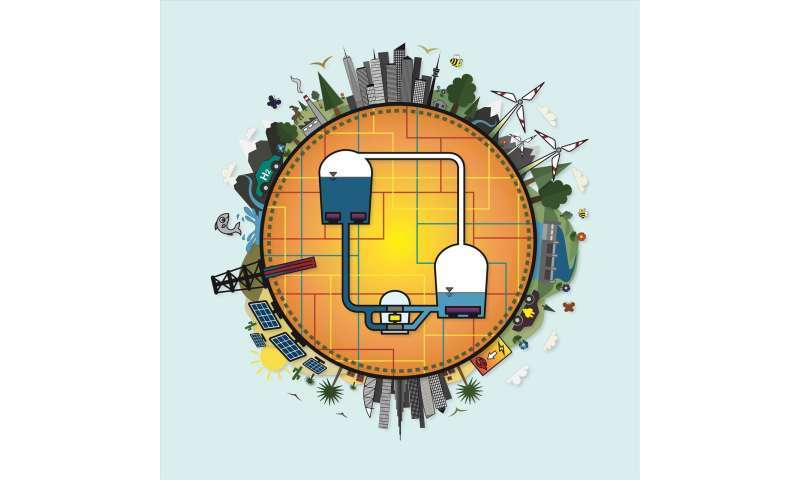 Thanks to this new developed energy storage, various renewable energy sources can be bundled by means of infrastructure connected to the energy grid, which in turn will help the energy industry to overcome the challenges it faces. The facility also stands out for its profitability. The payback period is shorter than with conventional pumped storage power stations," Pikl explains. The ecological aspects of the project also make it an attractive proposition: zero-emission operation is possible, no open spaces are required and the energy storage respectively power plant does not affect the natural water balance, which in turn reduces the environmental impact. Pikl is currently attempting to enlist the support of energy suppliers and companies for construction of a prototype hot-water pumped storage. "The separate technologies have been in use for decades, but nobody has ever come up with the idea of bundling them. Hitting the Paris Agreement target of limiting temperature increases to 1.5 degrees requires extensive measures while at the same time preserving our quality of life as far as possible. Our system could be one of the building blocks for safeguarding future energy supply using renewable s, and would also represent an energy-efficient, environmentally friendly step forward. The structures could operate for a long time, meaning they would also amortize in climate protection terms."